Oliva, M., Navarro, F, Hrbácek, F., Hernández, A., Nývlt, D., Pereira, P., Ruiz-Fernández, J. and Trigo, R. 2017. Recent regional climate cooling on the Antarctic Peninsula and associated impacts on the cryosphere. Science of the Total Environment 580: 210-223. Climate alarmists generally contend that current temperatures are both unnatural and unprecedented, as a result of global warming caused by anthropogenic CO2 emissions; and they claim that this "unnaturalness" is most strongly expressed throughout the world's polar regions. In this regard, they often point to warming on the Antarctic Peninsula (typically the Faraday/Vernadsky station) as the proverbial canary in the coal mine, where over the past several decades it has experienced warming rates that are among the highest reported anywhere on Earth. However, in recent years two studies have challenged this assessment. Carrasco (2013) reported finding a decrease in the warming rate from stations on the western side of the Antarctic Peninsula between 2001 and 2010, as well as a slight cooling trend for King George Island (in the South Shetland Islands just off the peninsula). 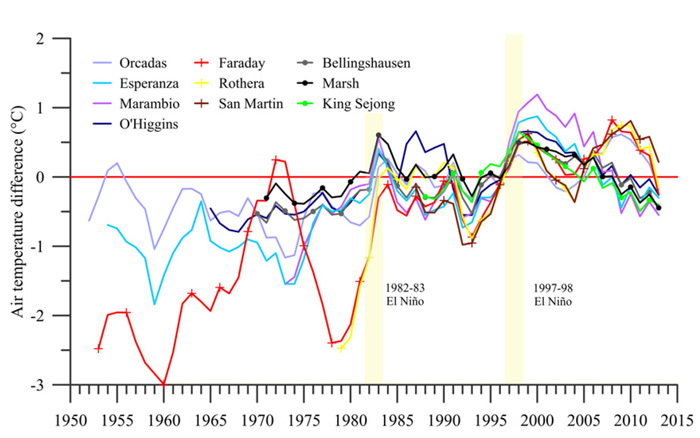 Similarly, in an analysis of the regional stacked temperature record over the period 1979-2014, Turner et al. (2016) reported a switch from warming during 1979-1997 to cooling thereafter (1999-2014). And now, in 2017, we have a third assessment of recent temperature trends on the Antarctic Peninsula confirming that the canary is alive and well! As their contribution to the debate, Olivia et al. (2017) report in the journal Science of the Total Environment how they "complete and extend [the study of Turner et al.] by presenting an updated assessment of the spatially-distributed temperature trends and interdecadal variability of mean annual air temperature and mean seasonal air temperature from 1950 to 2015, using data from ten stations distributed across the Antarctic Peninsula region." And what did that assessment reveal? In describing their findings, the eight European researchers write "we show that [the] Faraday/Vernadsky warming trend is an extreme case, circa twice those of the long-term records from other parts of the northern Antarctic Peninsula." They also note the presence of significant decadal-scale variability among the ten temperature records, which they linked to large-scale atmospheric phenomenon, such as ENSO, the Pacific Decadal Oscillation and the Southern Annular Mode. Perhaps most important, however, is their confirmation that "from 1998 onward, a turning point has been observed in the evolution of mean annual air temperatures across the Antarctic Peninsula region, changing from a warming to a cooling trend," especially over the last decade (see figure below). This cooling has amounted to a 0.5 to 0.9 °C decrease in temperatures in most of the Antarctic Peninsula region, the only exception being three stations located in the southwest sector of the peninsula that experienced a slight delay in their thermal turning point, declining only over the shorter period of the past decade. It is also pertinent to note that, coincident with the above findings, Olivia et al. cite independent evidence from multiple other sources in support of the recent cooling detected in their analysis, including an "increase in the extent of sea ice, positive mass-balance of peripheral glaciers and thinning of the active layer of permafrost." In light of all the above, the evidence is clearly mounting against those who point to warming on the Antarctic Peninsula as proof of CO2-induced global warming. For in the most incredible manner, warming trends that were once among the highest recorded on earth have slowed and even reversed to show cooling. Figure 1. Temporal evolution of the difference between the mean annual air temperatures and the 1966-2015 average temperature for each station (3-year moving averages). Source: Olivia et al. (2017). Carrasco, J.F. 2013. Decadal changes in the near-surface air temperature in the western side of the Antarctic Peninsula. Atmospheric and Climate Sciences 3: 275-281. Turner, J., Lu, H., White, I., King, J.C., Phillips, T., Scott Hosking, J., Bracegirdle, T.J., Marshall, G.J., Mulvaney, R. and Deb, P. 2016. Absence of 21st century warming on Antarctic Peninsula consistent with natural variability. Nature 535: http://dx.doi.org/10.1038/nature18645.